Race to the rescue with this outstanding 2-in-1, high-tech replica of a real-life airport rescue vehicle. This detailed model features a classic red, black and gray color scheme, large driver’s cab with detailed dashboard, wing mirrors, opening tool storage compartment, four-cylinder engine with moving pistons, twin-axle steering, double rear axle and chunky tires. Activate the boom to position the water cannon and extinguish the flames! This Power Functions upgradable model can be rebuilt to create an awesome Fire Rescue Vehicle! Price is 11% above the initial Lego retail price! This comes down to 9.14 cent per brick. The Airport Rescue Vehicle (42068) Lego set is available from the sites below. However, they do not offer delivery to your selected region. 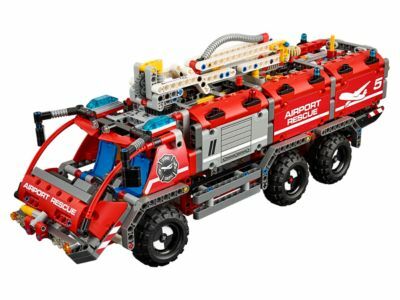 The Airport Rescue Vehicle (42068) Lego set is no longer directly available from the sites below. However, 3rd party partners of these sites might still have the set available. Alternate description Mobilize the Airport Rescue Vehicle!